Built. For. Comfort. That's the mission of the K2 B.F.C. 100 Heat Ski Boots and they've hit the nail square on the head! To achieve this, the 2019 B.F.C. 100 Ski Boots offer a wider, more spacious 103mm forefoot width to eliminate vice-like constrictions. Meanwhile, their electrically heated CushFit liners feature a sleekly integrated heat system that's free of bulky battery packs and hazardous wires. 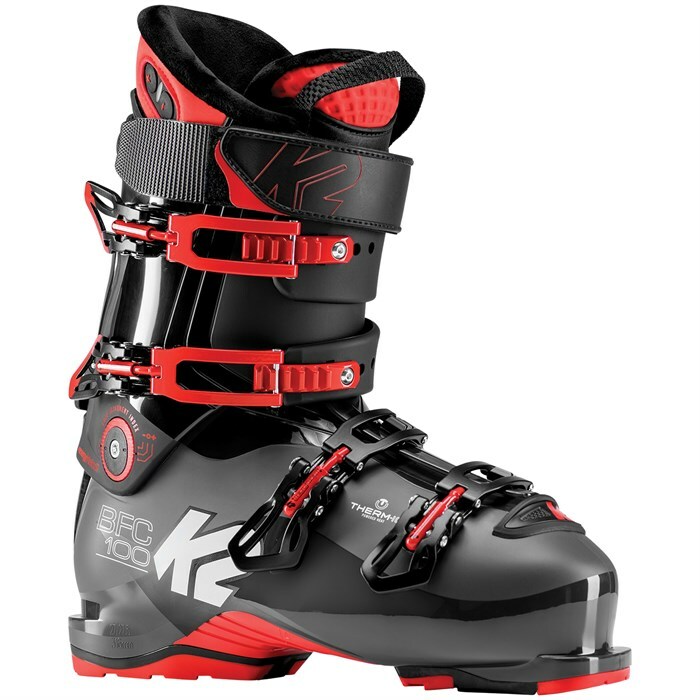 No longer does skiing mean sliding your feet into cold, narrow torture devices all-day -- the K2 B.F.C. 100 Heat Ski Boots are here to relieve your pain and reshape how you think about a day on the slopes! Hands Free Entry  Dual material overlap for intuitive and easy hands-free exit and entry. Flex: 100  A moderate flex for intermediate to advanced skiers. CushFit Therm-ic Heated Liners  Integrated heating system to keep your feet warm on cold days. Increases mobility and performance of foot muscles. Three heat settings provide warmth from 4 to 19 hours. Fully charges in 6 to 7 hours with a USB cable. Après Mode  Unlocks the upper cuff from the lower shell for comfort and convenience while walking from car to lift to apres and beyond, while still allowing to lock down for all-mountain performance.